Microsoft is serving up guerrilla marketing tactics to direct consumers into its highly anticipated new store in New York City. The new five-story location is set to open on October 26, so Microsoft has been popping up all over the city to spread the word and build the buzz. Winbeta.org shared the guerrilla marketing strategies that Microsoft is using to drive traffic to the store. 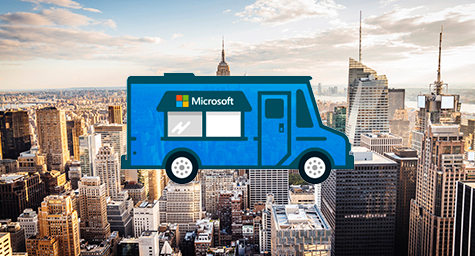 Microsoft launched its guerrilla marketing campaign by placing food trucks offering free food throughout the city. The trucks were in the traditional Microsoft Windows shade of blue to call the company to mind. As people lined up for free lunches, the truck’s staff urged people to also line up at the new store. In addition, Microsoft is planning to place prize machines in two random New York City locations each day next week. The machine will also be in the brand’s signature shade of blue and covered with Microsoft promotional labels. The prizes will include digital gadgets and goodies, which the machines will dispense for free when visitors tweet directly from the box. Microsoft’s final tactic will be giving away tickets to a special Pitbull concert set for the night of the store’s debut, as well as a chance to meet Pitbull in person. People who want the tickets are encouraged to line up at the new Microsoft store at 6:00 AM ET. With these creative guerrilla marketing strategies, Microsoft is taking unconventional measures to lead New Yorkers to its brand-new store. See where guerrilla marketing can take your business. Contact MDG Advertising.